Ideal for outdoor signage or a contemporary look for indoor art, Dibond is the term used to describe Aluminium Composite Sheet: white coated aluminium external surfaces bonded to a core of polyethylene. It is rigid yet relatively lightweight and very flat with low thermal expansion so ideal for long term outdoor use. Brushed metal finish: looks great as smart signage at your commercial premises. Works well with vinyl transfer lettering & logos (sold separately, please contact sales if you are unsure how to price). 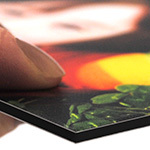 The surface can be printed and the result has a metallic appearance which can be desirable, however results will differ from printing onto a plain white background since white areas of the print will show as the brushed metal colour. 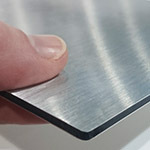 The direction of brush marks will vary depending on production requirements, if you require brush marks in a particular direction then please ask, however very large sizes may not give the option. Ideal for outdoor signage or a slick contemporary look for indoor art, Dibond is the most common brand name for Aluminium Composite Sheet. It is rigid yet relatively lightweight and very flat with low thermal expansion so ideal for long term outdoor use. Dibond can also be folded to give edge returns on a sign panel. Samples available on request. Mirror finish: looks great as smart signage at your commercial premises and is so good it can actually be used as a mirror. Works well with vinyl transfer lettering & logos (sold separately, please contact sales if you are unsure how to price). 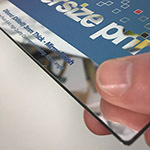 The surface can be printed and the result has a mirror finish which can be desirable, however results will differ from printing onto a plain white background since white areas of the print will show as the mirror surface. Ideal for outdoor signage or a slick contemporary look for indoor art, Dibond is the most common brand name for Aluminium Composite Sheet. It is rigid yet relatively lightweight and very flat with low thermal expansion so ideal for long term outdoor use. Samples available on request.